I made this for my mother as a Christmas gift. She has long hated my mice and rat creations that I make for my dollhouses. I show them regularly on my other fb page here. Well, hate is a strong word, I should really say instead, she's just so creeped out by them! lol She really is. She can't handle real ones OR fake ones! I decided to make her a mouse she can really love. One that's soft and fluffy and one that can't creep her out. 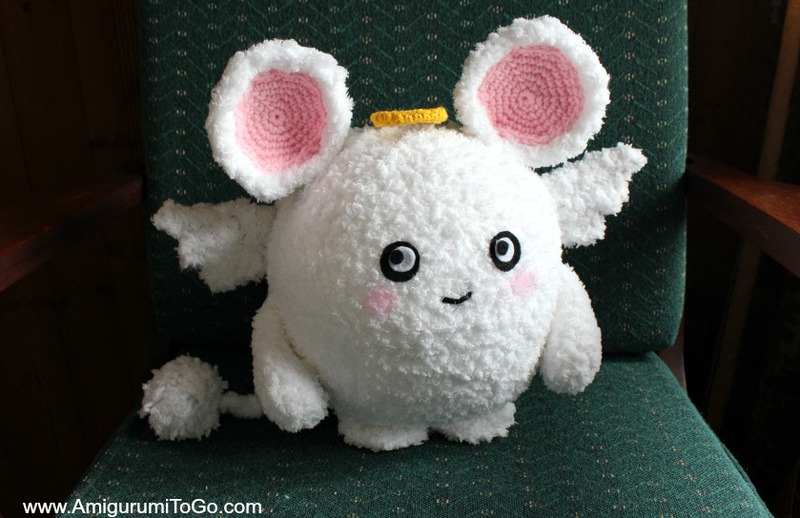 I thought a loving Angel Mouse was just the thing to melt that heart of hers and it did! When she opened her present she said, "awwwww" Then she hugged her Angel Mouse tight. Yay! PLEASE NOTE: With all that said, I didn't take pictures along the way of different parts while I made the mouse. It's just super hard to get good photos of separate pieces while using fluffy white yarn. This isn't a pattern for a beginner because the stitches are hard to see. It also requires some experience when sewing it all together. If you're just starting out in amigurumi making, I'd hate for you to get frustrated and this pattern might frustrate you. I did include as many photos and instructions in the assembly section. Be sure to read over these parts before putting your mouse together. The mouse is about 13 inches to the top of the ears and a whopping 28 inches around the middle depending how much you stuff her. This is a free pattern for all to enjoy. You'll find a print option at the bottom of the pattern. If you would like to leave a donation please do so by using the donation button also located at the bottom of this pattern. Donations of any size are greatly appreciated and do help me to keep on providing free patterns. long dress maker pins OR bobby pins (hair pin). Regular stick pins do not hold the pieces together very well. Read me ~> Add in a marker at the end of row 2 and move that marker at the end of every row. Work in continuous rounds, do not join. Have any questions or if you come across a mistake in the pattern please leave a message in the comment section below. Starting at the top of the head holding reg yarn and pipsqueak yarn together. Use a 6.5mm hook for all unless otherwise stated: NOTE: Please see assembly section below before sewing any parts together. * stuff the doll now, it will take lots of stuffing. Shape as you stuff. The body should be nice and fat when done but not stiff. f/o leavening a tail for sewing. Weave in and out of the remaining stitches. Before closing the gap, add more stuffing. Once you're done stuffing, pull the yarn tail to close the gap. Knot off and hide the yarn tail in the body. f/o leaving a long tail for sewing. Sew inner ears to the outer ears. f/o leaving a long tail for sewing. Stuff hand area, very lightly stuff arm. NOTE: you can work the starting yarn tails into the 2nd row. Or just leave them hanging then tuck them in between the body and the leg when you sew the legs to the body. f/o leaving a long tail for sewing. Stretch out with your fingers before sewing legs to the body. 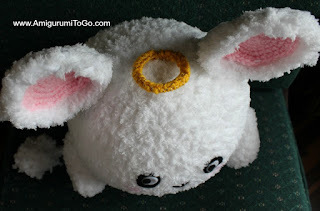 NOTE: The tail can be sewn to the body as is. I added a super soft pom pom to the end by making one with reg yarn and pipsqueak yarn held together. I wrapped around 3 fingers about 30 times. 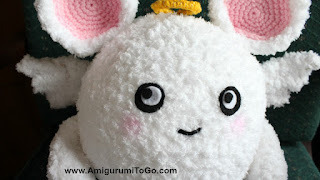 I do have a video showing how to make this kind of pom pom using just your fingers here. 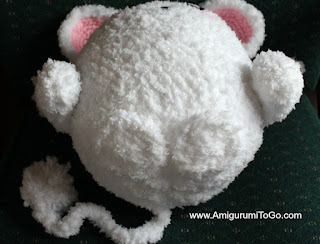 You don't need to add the pom pom though, this part was really just an add on for my mother who find mice tails creepy. *Please be aware that pom poms are unsafe for small children. The fibers can be pulled out and become a choking hazard. 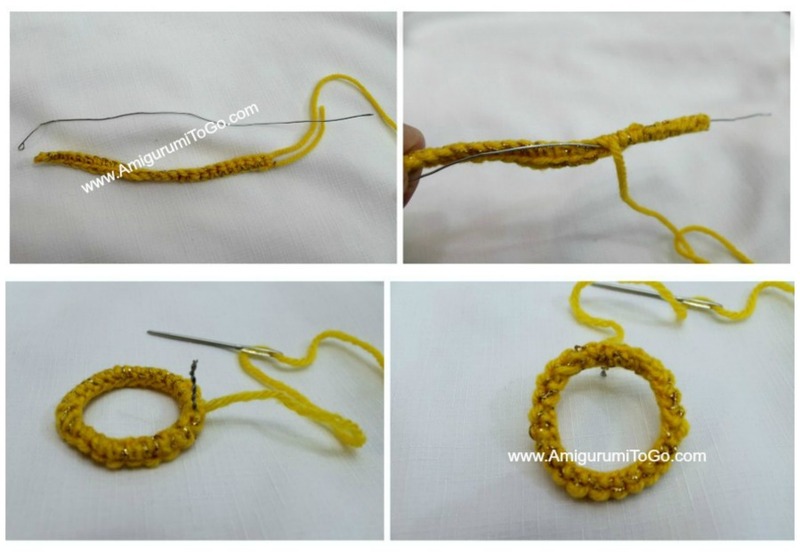 Halo: Holding yellow yarn and golden thread (if you have some) together and a 4mm hook. 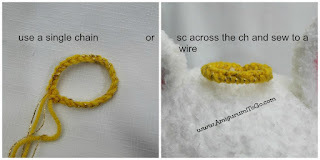 NOTE: You can make a single chain and f/o or do what I did, add another row then sew it around a wire. I think either way is just as good. f/o leaving a very long tail for sewing. Place a wire in the center leaving a bit hanging over on each end. Loop each end so they don't poke you while you are stitching the piece closed. It's a bit awkward stitching it because it's almost too narrow to close but do your best, using you yarn needle just go through the outer loops on each side and pull tight. Then bend the piece to form a loop and sew the ends together closing circle. Bend the wire ends, twist them together and trim. Leave about an inch or so that you can push into the head. *Use bobby pins if you have them, they work the best on this project. Pin everything in place before sewing. Please pin first! 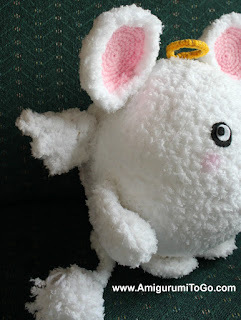 I rushed mine a bit and ended up have to remove the arms and wings as I sewed them on a bit wonky. Removing parts from a piece made with fluffy yarn is very difficult once sewn on, so take your time in pinning then viewing from different angles before sewing. You will be happier with the end product! 1) sew the arms on. I sewed the open end to the body first then also added a few holding stitches just under the "hand" part to keep the arms from flaring outwards. 2) sew the ears on. These will be a bit floppy while sewing so take your time. They are in line with the arms. 3) sew on halo. Depending on which halo you made will determine how it's sewn on. Mine was made with wire. I sewed the stem of the wire to the head and left the front of the halo free of stitches so it stands up a bit off of the head. 4) sew on the wings. See how the arms and ears are pretty much in line with each other and the wings are behind those a bit. 5) sew the legs on. I sewed them very close to the front of the doll and left the very front of the legs free of stitches, sewing only the back part to the body. Again, pin these on first! Then stand the doll up and see how it looks before sewing. 6) sew the tail on. 7) Do the face. I left the face for last. It's much easier to center the face once all the other parts have been sewn on. You can do whatever you want with the face. I kept mine simple but the finishing touches are totally up to you. I cut 2 larger pieces of black felt, 2 medium pieces of white felt and 2 small pieces of black felt to make up the eyes. These are all hot glued together then hot glued to the doll. Play around with the eye placements before gluing. 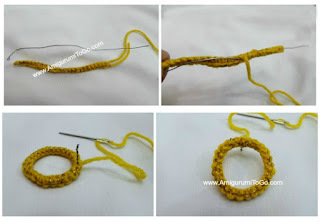 Once hot glue touches yarn it will not come off so do this part very carefully and use very little glue. The mouth is one strand of black yarn. I used a q-tip to rub on some blush to add a bit of color to the cheeks. OMG!!! This is soo adorable!!! I've got a ball of fluffy white wool and couldn't decide what to do with it, now I know. I believe it was this year you started a small white mouse, or did I dream it. I remember at the time said was still in progress but not heard anything. It was so adorable and I for one been watching and waiting. Happy New Year to you and family. I did mange to get my Christmas orders out and now have more because more ppl saw them. Will send you my thank you gift. It sure has kept my mind off grieving and knowing children will enjoy them so much. I think you're speaking of a small white rat I made my son? That was never going to be a pattern as there were some parts I made, like the tiny hands with fingers, that would be too hard to explain in written form. I did share it here on my blog.I think that's what you're thinking of. OR it could be a tiny mouse I made that goes along with my Lil Trouble Teddy series? If so, that one I'm actually working on this very day, lol I have 2 patterns coming out before 2017... one day left to get these posted! Thank you so much for the very generous donation, I appreciate it a whole lot! Yes, paypal takes a bit off the top but I can transfer to my bank for free so that's one consolation. Thank you very much again! I'm so glad you have been enjoying the patterns and working through this time of grief. I'm thrilled to know children will enjoy the things you have made. Thanks for letting me be a part of it by using my patterns. That always brings me a whole lot of joy.